We can’t provide a pronunciation guide or directions to R’lyeh, but that’s Old One for, “In his house at R’lyeh, dead Cthulhu waits dreaming.” Normally we’d say let the big guy sleep, but lately feels like as good a time as any to rouse the dead god and let it all end. 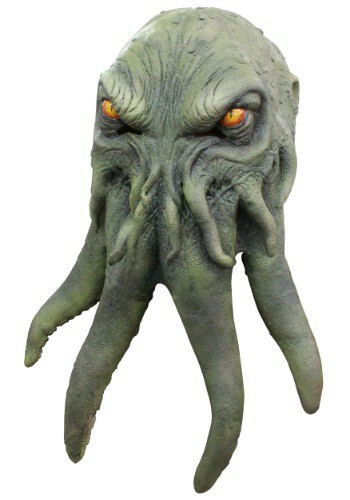 So go for it––spread Cthulhu’s image out there into the world with you in this Cthulhu Adult Mask, and see what happens. What have you got to lose? Besides your sanity, that is. No way you’re getting out with that. Leave whatever you find in Miskatonic State University’s library for future Cthulhu seekers to follow up on before you’re permanently committed to the Danvers State Insane Asylum. Dread Cthulhu’s alien visage might seem out-there, but it’s pretty much the only one of H.P. Lovecraft’s creations we could even make a mask of. Masks of Nyarlathotep might be one of the most critically acclaimed tabletop role-playing campaigns of all time, but you try actually making one. We have. They don’t call him the crawling chaos for nothing––it just looked like black cottage cheese all over the wearer’s face. Don’t think a shoggoth dog costume isn’t one of our most requested items every Halloween––it’s just really hard to make satisfactorily. Costume materials have improved a lot since the brittle plastic rubber-band masks of yore, but we still can’t do myriad temporary eyes and self-luminous protoplasmic bubbles.